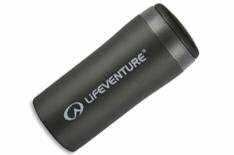 1st Lifeventure Thermal Mug | What Car? Easily the best cup we tested for keeping our drink warm after a couple of hours the temperature was still a piping-hot 72C. The Lifeventure cup was also completely watertight, so it can be carried around in a bag. The biggest drawback of the Lifeventure is that you need to remove the lid completely to take a swig. A tenner isnt bad considering that pricier cups didnt perform anywhere near as well in our temperature test. Has a classy metal case and the Lifeventures screw lid also forms a tight seal, which didnt leak in our tests. Its compact, too.